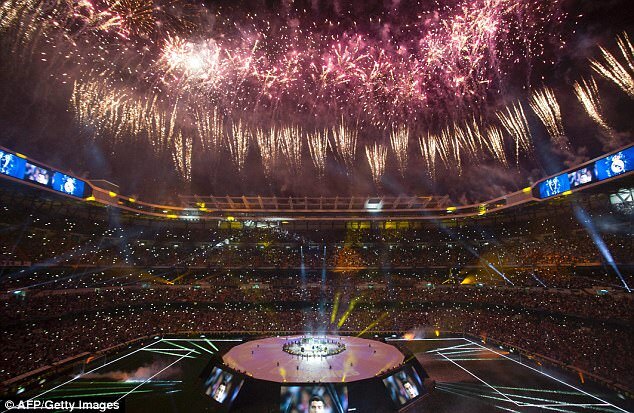 Maestro Ronaldo: the bigger the stage, the bigger his game! Forget, for a moment, the goals. Yes, all 600 of them. Yes, even the two in Cardiff on Saturday. 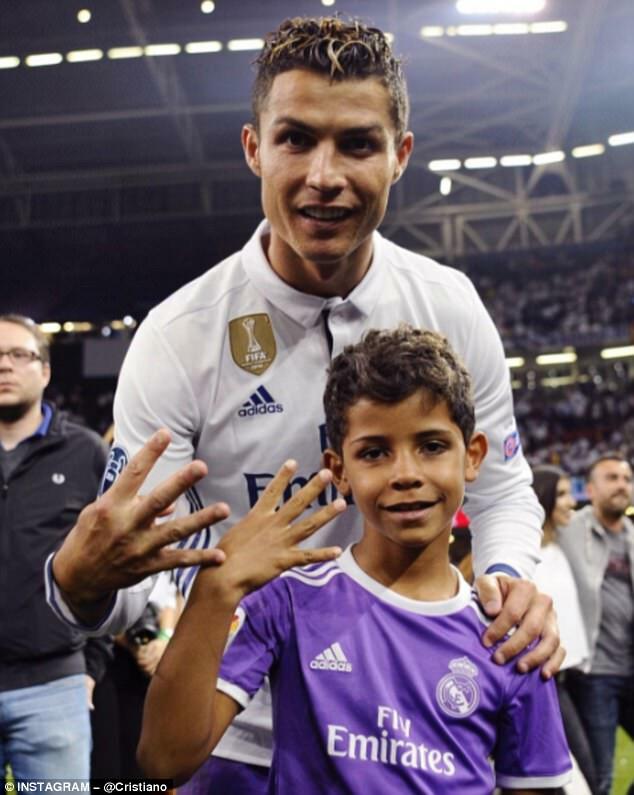 Here are a couple of vignettes from Cristiano Ronaldo’s fourth Champions League victory. Failures, really. Dismissed almost instantly by those who saw them. A pair of inconsequential trifles that may just show what sets him apart as a footballer. In the 27th minute, Mario Mandzukic equalised for Juventus. He did so with the most exceptional overhead kick, having first kept the ball up on the edge of the Real Madrid area. It truly was one of the goals of the season; arguably one of the finest a Champions League or European Cup final has seen. So, from Real Madrid’s next attack, Ronaldo attempted an even more spectacular, first-time, overhead kick of his own. He got a decent connection, but it was blocked, early, on its course to goal. Yet he tried. That is what makes him special to watch. It mattered to him that Mandzukic had, momentarily, stolen the spotlight. He didn’t want to be outdone. 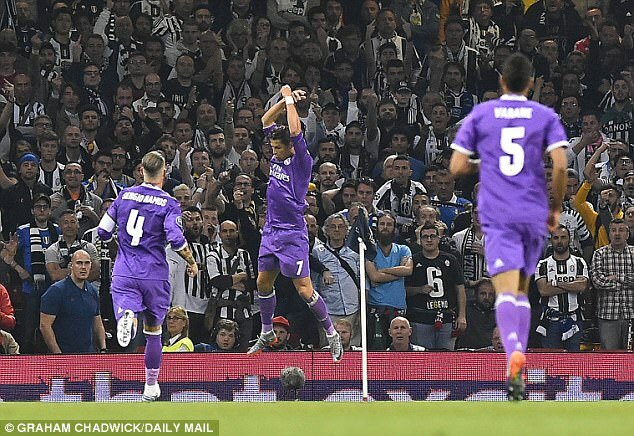 He didn’t just want to get his team back in front; he wanted to be the man who scored the best goal of the 2017 Champions League final, too. There, in miniature, is his rivalry with Lionel Messi. Of course it’s personal. Ronaldo takes football personally. He doesn’t just want to be on the winning team. He must be the best player on that team, and lauded as such. He must be the player everyone talks about as they leave. How many footballers are happy to place that pressure on themselves in every game they play? Not enough. How many would deliver if they did? Almost none. Shortly afterwards, Madrid put the ball into a crowd of players in the box. 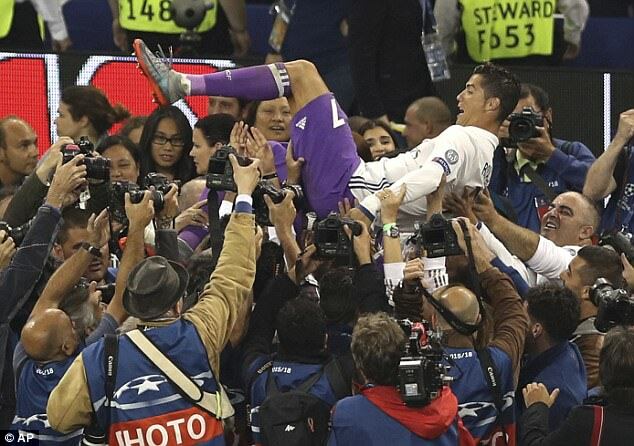 Ronaldo jumped but it sailed over his head. Yet replays showed that his leap put him half a torso higher than any other player challenging; and Juventus do not have a small defence. So this is a player whose greatest gifts are with the ball at his feet, who now assumes responsibility to lead the line. At 32, most forwards are looking to reinvent themselves in areas that are less exposed. Midfield, mostly. Pull the strings, dictate the play. Stay out of the front line. Yet Real Madrid have two immense players who do that: Luka Modric and Toni Kroos. 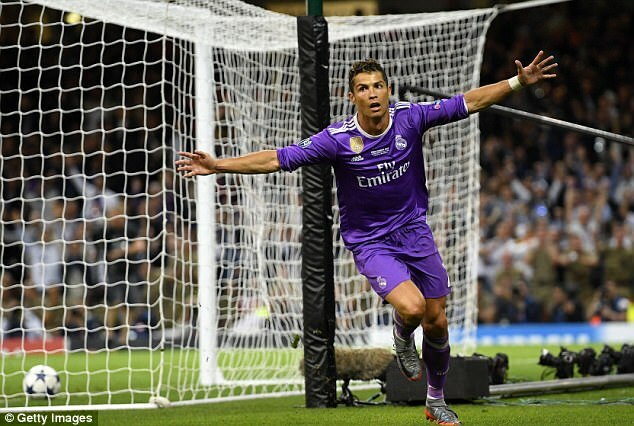 And Ronaldo enjoys the glory too much to wholly turn provider. So his reinvention is as a striker. He has taken on the same responsibility as Zlatan Ibrahimovic or Kylian Mbappe. He is Madrid’s target man. And now we can remember the goals because this is the seventh consecutive season that he has scored over 50, for club and country. In his last 10 games of the season, he has scored 16 times; including five against the champions of Germany, two against the champions of Italy, five against two teams who will represent Spain in next season’s Champions League. He is a bully, but not just one for the flat track. He is the bully’s bully, he pushes other bullies around: Bayern Munich, Juventus, Atletico Madrid, Sevilla. 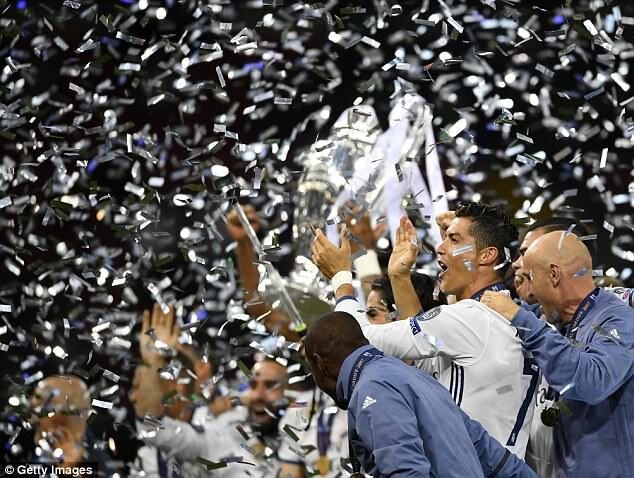 ‘The numbers don’t lie,’ Ronaldo said in a tent outside the Principality Stadium, a rather incongruous setting for the presentation of his man-of-the-match award. He repeated that statement a couple more times, for emphasis. Giving him the trophy was his mentor, Sir Alex Ferguson, a man who has spent a lifetime in football and, as such, would have every right to be a little jaded. Yet part of Ferguson’s brilliance as a manager was the enthusiasm he maintained, and expected of his players, and he showed it in Cardiff on Saturday, apparently celebrating Ronaldo’s goals as throatily as any supporter. He has that power to affect, this marvel of a player. There is something special about watching Ronaldo because he wants you to remember him; he wants his performance to burn into your brain; he wants it to be cherished; he wants the story passed on to your grandchildren. His name would fit right into that verse. 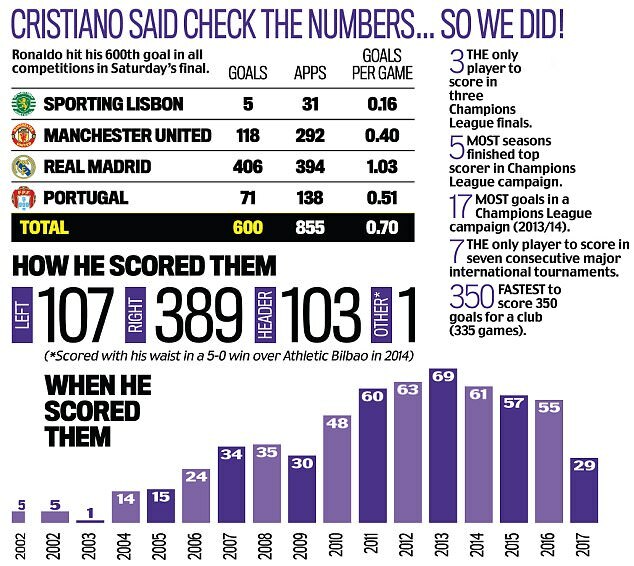 And the show is what Ronaldo guarantees. He will not always be the winner, he will not always be the best player, but he will always try to be both. So if he thinks Mandzukic has stolen your affection, he will try to win it back. If the game is there to be won, he will try to be the one who wins it. He scored the first goal here, and the one that put the outcome beyond doubt, Madrid’s third after 64 minutes, his determination to connect to Modric’s cross even greater than that of Juventus’s defenders to smother it. And, when he did, he sent it past the great Gianluigi Buffon with such an uncommon mixture of speed of thought and delicate care. It was the first time Juventus’s goalkeeper had been beaten by a clean shot, not a deflection. Since the early days of the competition, when 39 goals were scored in seven finals, the match to decide the best of Europe has most often been a cagey affair. 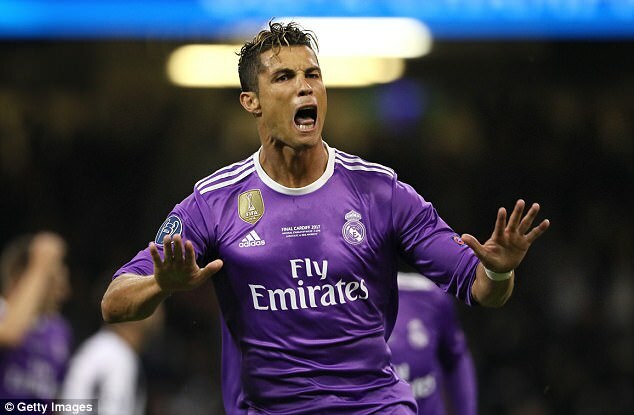 Only six finals since 1962 have been won by a team scoring four goals: and Ronaldo has now been involved in two of those matches. Juventus had only conceded three goals in European competition all season before they met his Real Madrid team. They last shipped four in one game against Bayern Munich on March 16, 2016. It was the same against the notoriously difficult Atletico Madrid. 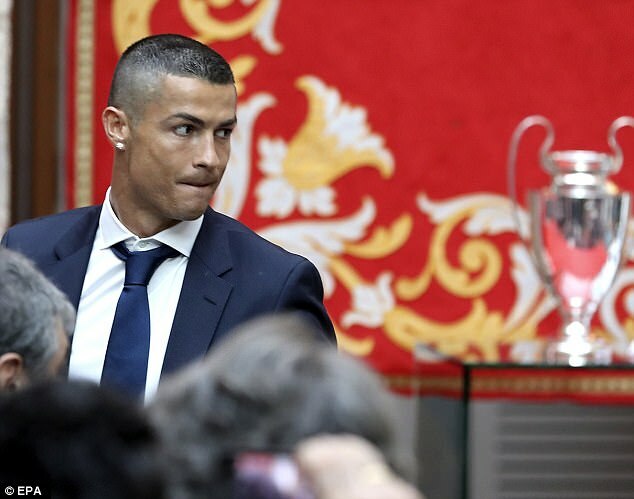 When Ronaldo scored three goals against them in May’s semi-final, it was the first hat-trick Diego Simeone’s team had conceded since November 19, 2016 – when Ronaldo scored all three in a 3-0 La Liga win. That was the first time Atletico had let a player score three times since Ronaldo did it on April 11, 2012, this time in a 4-1 victory. Indeed, Atletico have only suffered three hat-tricks in Simeone’s time in charge: all to Ronaldo. 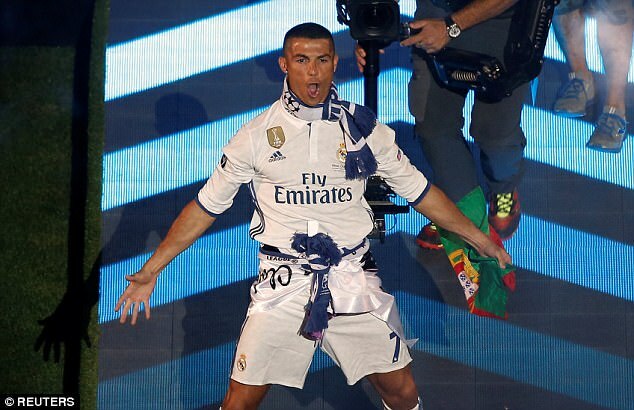 ‘I have had an amazing season,’ said Ronaldo, ‘but then I have the opportunity to say I have had an amazing season every year. Unsurprisingly, it was the group that coach Zinedine Zidane wished to talk about, above any individuals, or even himself. ‘I was a scandalously bad coach, and now I’m the best,’ he deadpanned, with the shrug of a man who is only too aware of football’s extremes. 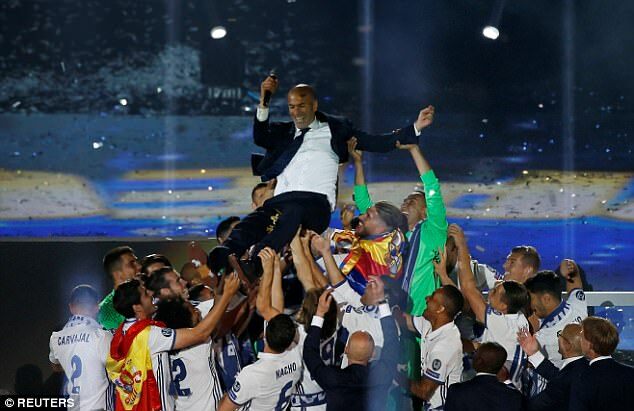 He did admit, though, to being part of history — the first Real Madrid coach to do the La Liga-European Cup double since 1958, the first coach of any club to retain the Champions League in its modern format. As much as it may seem Ronaldo’s stage, such a level of attainment is impossible without a magnificent supporting cast and there were some outstanding performers for Madrid in Cardiff. Marcelo’s work for Madrid’s fourth goal, scored by Marco Asensio, was brilliant, Modric was stunning and Kroos rarely puts a foot wrong. Madrid’s defence was outstanding, too, even if Sergio Ramos’s actions to get Juan Cuadrado sent off infuriated. Yet, for all their many talents — including those of their coach — do they win this without Ronaldo? Undoubtedly not. 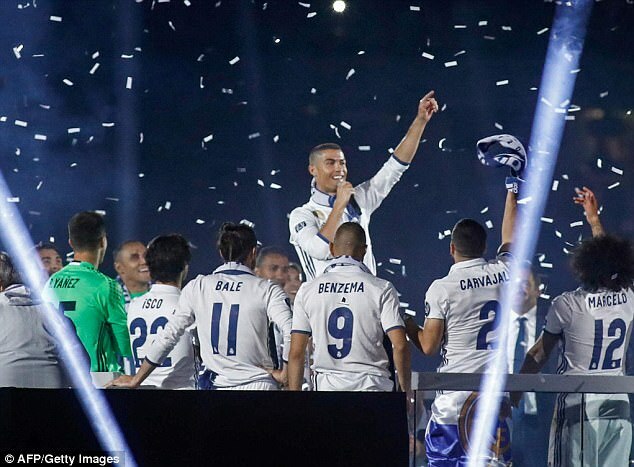 He stood to one side as Ramos lifted Madrid’s 12th Champions League trophy, and their third in four years. He knew he would be remembered no matter his situation in the picture frames. This was still his show. ‘I was surprised to hear for so many weeks that we were the clear favourites,’ said Juventus coach Massimiliano Allegri. He didn’t have to name him. He didn’t need to. We all know him and we all know his deeds; and that’s all he’s ever really wanted.